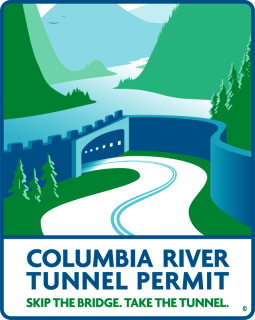 Proudly display the Columbia River Tunnel Permit Bumper Sticker on your car bumper or window to confuse family and friends. 4"x 3"
This eye catching Columbia River Tunnel Permit sticker about a non-existent tunnel is uniquely Pacific Northwest. Playfully illustrated in colors similar to the Oregon and Washington license plates, it celebrates the beauty and splendor of the Columbia River Gorge and is a must have souvenir for the windows and bumpers of RVs, Campers, Boats, Trailers, Trucks, and Cars of locals and tourists alike. Produced locally, and made of high quality, weather & UV resistant materials. Buy the Party Pack of 25 and save 10%. Great for parties, gift giving, the office, and wedding favors! Free Shipping. WA Residents - we pay the tax for you. Save 10% when you purchase this "Party Pack". This pack of 25 tunnel permits would make a great addition to your party or function; use as shower or wedding favors, grab bag items, or prizes at all types of social gatherings. Produced locally, and made of high quality, weather & UV resistant materials.